I am trying Itemz for the first time, and am excited for the possibilities. I just want to check to see if there is anything to be concerned about the following, before I get further into development. I just wanted to find our if these might be caused by something I did wrong, or if they can safely be ignored. 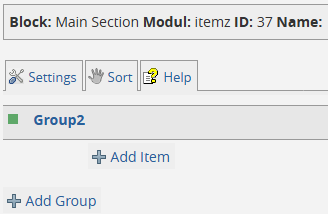 Yes, because without group(s), yo can't create items. About the notices, they are just caused by untidy program code (undefined variables), but nothing to worry about. Okay. Thank you for the reassurance. There was a notice in the backend and some unclear text. For anyone interested, here is an updated English Language file for itemz_0.9.5_1. I thought this addition might be helpful to other English users.